(Confession Scene) This has gotta be the first time I've ever rated someone else first! Is this... love? 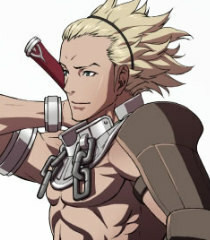 The Vaike is STUNNED! (Death Quote) Ogre's teeth! Not even ol' Teach can keep fightin' in this state... Oww..
(Improv) You seem to always be losing your axe behind before battle. Ever thought of any tricks to help you remember?